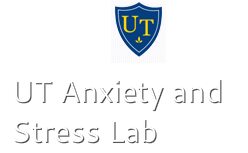 Listed below are some of the areas that the Anxiety and Stress Lab faculty have examined. * Papers marked with an asterisk included a student advisee co-author at the time of submission (the student's name is underlined). Francis, S. E. (2014). The role of parental anxiety sensitivity in parent reports of child anxiety in treatment seeking families. Clinical Child Psychology and Psychiatry, 19, 111-124. *Noël, V. A., Lewis, K. M., Francis, S. E., & Mezo, P. G. (2013). Relationships between the multiple dimensions of anxiety sensitivity and symptoms of anxiety and depression in men and women. Journal of Cognitive and Behavioral Psychotherapies, 13, 333-353. *Noël, V., & Francis, S. E. (2011). A meta-analytic review of the role of child anxiety sensitivity in child anxiety. Journal of Abnormal Child Psychology, 39, 721-733. *Levine, J.C., Fleming, R., Piedmont, J.I., Cain, S.M., & Chen, W. (2016). Heart rate variability and generalized anxiety disorder during laboratory-induced worry and aversive imagery. Journal of Affective Disorders, 205, 207-215. *Levine, J.C., Fleming, R., Piedmont, J.I., & Cain, S.M. Emotion Regulation and Three Hour Ambulatory Cardiovascular Activity in Generalized Anxiety Disorder. in prep. *Byllesby, B. M., Elhai, J. D., Tamburrino, M., Fine, T. H., Cohen, G., Sampson, L., Shirley, E., Chan, P. K., Liberzon, I., Galea, S., & Calabrese, J. R. (2017). General distress is more important than PTSD’s cognitions and mood alterations factor in accounting for PTSD and depression’s comorbidity. Journal of Affective Disorders, 211, 118-123. *Roley, M. E., Contractor, A. A., Weiss, N. H., Armour, C., & Elhai, J. D. (2017). Impulsivity facets’ predictive relations with DSM-5 PTSD symptom clusters. Psychological Trauma: Theory, Research, Practice and Policy, 9, 76-79. Yang, H., Wang, L., Cao, C., Cao, X., Fang, R., Zhang, J., & Elhai, J. D. (2017). The underlying dimensions of DSM-5 PTSD symptoms and their relations with anxiety and depression in a sample of adolescents exposed to an explosion accident. European Journal of Psychotraumatology, 8, 1, 1272789. Mezo, P. G., & Francis, S. E. (2012). Modeling the interrelationship of learned resourcefulness, self-management, and affective symptomatology. Journal of Psychopathology and Behavioral Assessment, 34, 11-21. Elhai, J. D., Levine, J. C., & Hall, B. J. (2017). Anxiety about electronic data hacking: Predictors and relations with digital privacy protection. Internet Research, 27, 631-649. Elhai, J. D., Levine, J. C., Dvorak, R. D., & Hall, B. J. (2017). Non-social features of smartphone use are most related to depression, anxiety and problematic smartphone use. Computers in Human Behavior, 69, 75-82. Elhai, J. D., Hall, B. J., Levine, J. C., & Dvorak, R. D. (2017). Types of smartphone usage and relations with problematic smartphone behaviors: The role of content consumption vs. social smartphone use. Cyberpsychology: Journal of Psychosocial Research on Cyberspace, 11(2), 3.